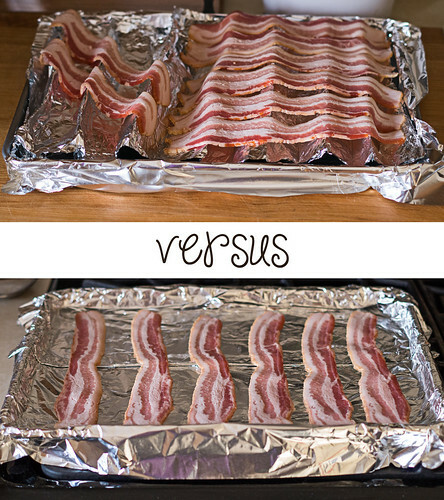 Oven-Cooked Bacon: Which Method Works Better? However, I don't love cooking bacon. Standing over the stove, with my vision slowly being obscured by the thin film of bacon grease covering my glasses... I'm not interested. Sure, it's great to have a batch of bacon grease at the end to save for another application, but I never actually end up saving it (mostly because I'd find an excuse to fry EVERYTHING in the leftover grease, and I enjoy keeping my heart beating regularly). I don't mind bacon that's been cooked in the microwave, but it requires some annoying cleanup as well. Purpose-made plates with ridges and channels to let the bacon drain as it cooks are a pain to wash, and the microwave ends up covered in grease splatters. Links have been circulating on Facebook and Pinterest claiming that you can cook bacon in the oven. There are a few methods out there - on top of a cooling rack, directly on a foil-lined baking sheet, and by making a "rack" out of foil. I immediately discounted the cooling rack method, having had multiple bad experiences with trying to wash little meaty bits out of the grid (and the last cooling rack I tried to wash in the dishwasher got completely rusted over, so I'm not eager to ruin another one). So that leaves the 2 foil-based methods for easy cleanup. Whenever I roast veggies or make tater tots, I line a baking sheet with foil so that I don't have to wash it afterwards. The idea of applying that same principle to bacon-making was very appealing. 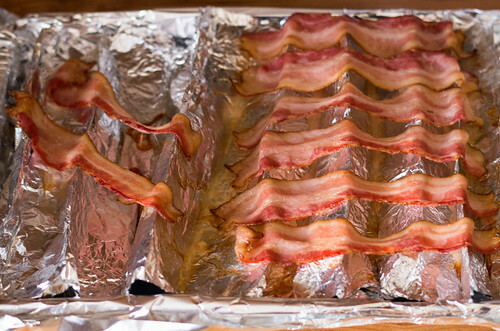 I suspected that the rack made from the foil "accordion" would be more effective for crisping the bacon by allowing for more airflow and draining the grease. Conversely, I figured that the bacon cooked directly on the pan would be soggier and greasier from sitting in its own fat without draining. Both methods began with lining the baking sheet with foil. If your aluminum foil isn't wide enough to fold over the sides of the pan (to prevent the bacon grease from getting on the pan), crimp 2 pieces together in the middle by lying one piece on top of the other, and folding the long sides over each other 2-3 times. When the pieces are secured together, spread them out - you should have a double-wide piece of foil to line your pan and fold easily over all sides. For the foil "accordion" rack, simply fold a piece of heavy-duty foil that's about twice as long as the pan back and forth like an accordion, and spread it out to fit in the pan. The bacon is then laid out over the "rack". Don't have heavy-duty foil? Stack 2 pieces of regular foil and fold as if it was one piece. 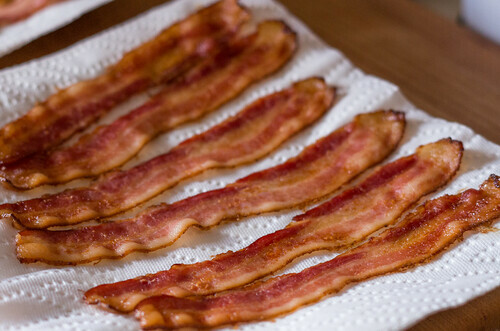 Both batches of bacon were started in a cold oven, set to 400°F. Since I used a thicker-cut bacon (not super-thick, but thicker than typical bacon), I left them in the oven for 30 minutes total, but began checking on them every few minutes at the 18 minute mark. After removing from the oven, I drained and blotted both batches with paper towels. I was surprised by the end results. The bacon cooked directly on the pan ended up cooking more evenly, and was less greasy after blotting. The bacon cooked on the "accordion" rack didn't drain nearly as well as I had theorized. The bottom of the bacon strips didn't cook nearly as well as the top because they weren't in contact with a hot pan. They ended up greasy and slightly flabby, even after blotting. Don't get me wrong - I still ate plenty of bacon from both batches. But, it's not worth using extra foil and an extra couple of minutes to fashion a makeshift "rack", and that makes this Slacker Gourmet very happy. 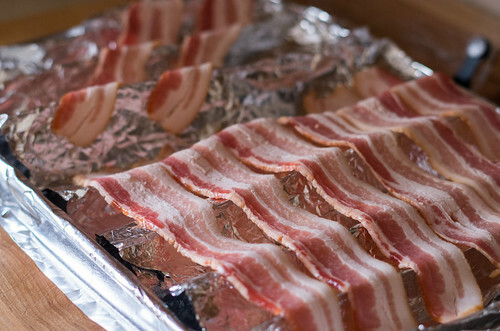 Line a baking sheet with foil, making sure to fold the foil over the sides to prevent bacon grease leaks. If your aluminum foil isn't wide enough, make a double-wide piece of foil by crimping 2 pieces together in the middle. 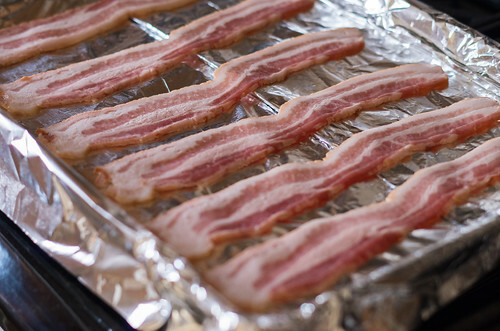 Lay the bacon out evenly across the baking sheet - try not to have them touch. Put the baking sheet in a cold oven and set it to 400°F. For thinner pieces of bacon, begin checking for doneness at the 17 minute mark. For thicker-cut bacon, begin checking for doneness at 20 minutes. 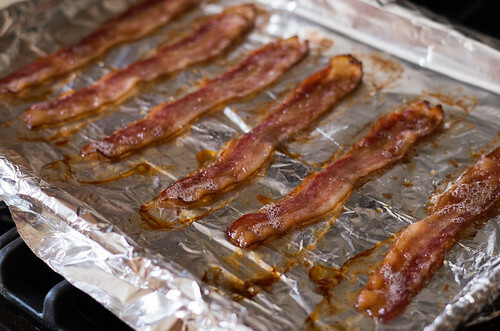 When the bacon is browned around the edges and at your preferred doneness level, remove the baking sheet from the oven. Using tongs if the bacon is too hot to handle, transfer the bacon strips to a paper towel-lined plate, and blot the top of the bacon with another layer of paper towels. If you want to save the bacon grease, carefully pick up the foil lining and drain the grease into a container. If you just want to dispose of it, you can do one of two things: layer some paper towels on the foil to soak up most of the bacon grease, then carefully fold up the foil for disposal; or wait until the grease cools and solidifies and fold up the foil at that point. Hopefully, you shouldn't need to wash the pan! Our oldest kitty, Oliver, hasn't been feeling quite like himself for awhile. Even after many vet visits, he ended up at the emergency vet for a couple of nights this past weekend. I don't want to get into too many details about what's wrong, but he came home with a feeding tube for meals for now. This has resulted in me making what can only be described as a "liver milkshake" in smell and texture out of canned food and water, for pumping into the feeding tube. Yummy. Partially to distract myself from worrying about Ollie, and yes, partially to eradicate the lingering odor of his dinner, I set out to make some more oatmeal cookies. As much as I adore my double chocolate peanut butter oatmeal cookies (known as DCPBOC from here on out), I wanted to make something with a completely different flavor profile. I wanted to use the same basic recipe, with the building blocks of nut butter, oats and gluten-free flour giving the same soft-but-toothsome texture, so I settled on making a maple nut oatmeal cookie. The recipe is quite similar to the DCPBOC - almond butter instead of peanut, grade B maple syrup (for a distinct but not overwhelming maple flavor) instead of brown sugar, extra flour and less milk, and pecans instead of chocolate chips. The resulting cookies, based on my initial guesses at amounts for substitutions, were everything I hoped for - maybe more! Salty, sweet, nutty... just like me. As with the DCPBOC, I made these gluten-free and vegan, but regular all-purpose flour and dairy milk should work just fine here. Even though we don't typically eat vegan in our house, I love making eggless cookies because I can rationalize "taste-testing" a lot more cookie dough without raw eggs giving me pause. 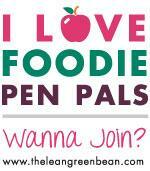 So go ahead - let your kiddos and your grandmothers grab a spoon and eat the dough too - I won't tell. Add almond butter and maple syrup to the bowl of your stand mixer, and beat on medium speed until well combined (2-3 minutes). Add vanilla extract and beat until mixed in. Stop the mixer. Add the flour and mix on a low speed until just combined. Stop the mixer again, add oats, baking soda, and salt and mix again on low speed until just combined. The dough at this point should be somewhat crumbly and sticky. With the mixer running at a low to medium speed, add the milk in a thin stream. By the time you finish adding the milk, the dough should come together and pull away from the sides of the bowl. Stop the mixer, remove the bowl and mix in the chopped nuts with a spoon. Using a cookie scoop (I used my OXO Good Grips Medium Cookie Scoop) or 2 spoons, drop rounded tablespoonfuls of dough a couple inches apart on the prepared sheet pans. If you're using a cookie scoop - don't overfill it - this dough is pretty sticky and thick, so you don't want to overtax the spring release mechanism. Flatten them out to about 1/4 inch thick with the palm of your hand - they won't spread much in the oven. Bake for 9 - 10 minutes (11 minutes in my oven, but I tend to always need another minute past the upper bound of recipe times) - the tops of the cookies should look slightly dry and may be starting to just barely crack in places. Remove from the oven and let cool on the pans for 5 minutes, then transfer the cookies to a cooling rack to finish cooling. Enjoy with a glass of milk, or with more cookies.